This post will stay on top til April 21. Please scroll down for newer posts. Thank you! Hi there! My favourite time of the year is finally here. Oh, how I looooove these warmer days, sun, I love seeing flowers blooming ... Oh yes, spring arrived. :D And since today is the first day of spring, I thought I'd offer a small candy on my blog to celebrate this wonderful season. What do you think? Do you like the idea? ;) I put together some things that remind me of spring. 1.) Be a follower of my blog (please, only follow me if you like my blog, not just because of the candy). 2.) Post a picture of my candy on your blog (sidebar) and link back to my blog. 3.) Use latin alphabet; all entries written with cyrillic letters will be deleted! 5.) Leave me a comment in case Mr. Linky goes bye bye (it has a bad habit of doing so sometimes). But please keep your comments in English or Slovenian. Thank you! 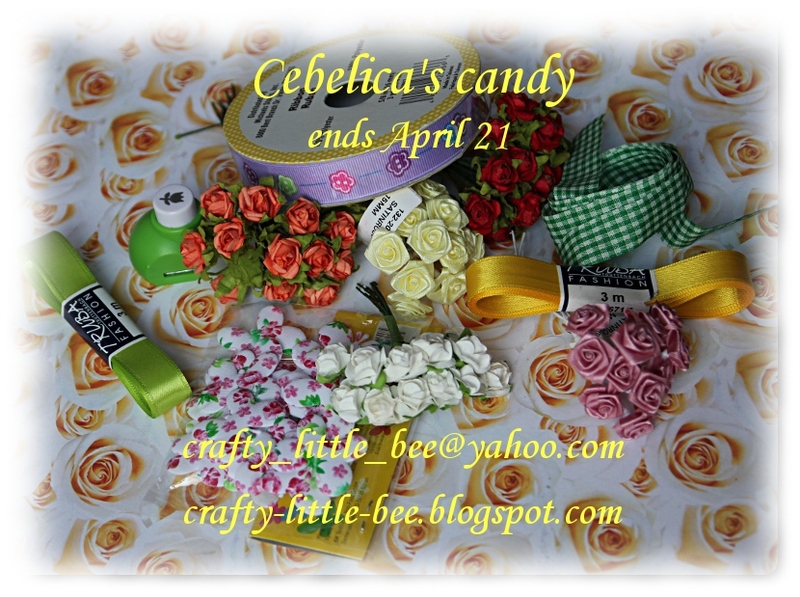 The candy ends on April 21 (midninght) and I'll announce the winner a day or two after that. Good luck! Love the tutorial on making background paper. Hi Cebelica what some fantastic candy you have chosen to offer one lucky winner, I have posted a picture and linked it to you. Res je pomlad najlepši letni čas. Hvala, ker lahko sodelujem. I'm also a Springfan. Love it when all the flowers and trees start to bloom. Love your candy so thanks for putting it up. Lovely blog...and lovely candy...I also love the Spring. Beautiful candy. Thank you for the chance to win! thank you for this faboulous chance!! I'm your follower and put the image on my sidebar!!! I love the warmer weather too Cebelica, although the last few days have been a bit dull !! Wonderful candy, Cebelica. I'm heading over to put it on my sidebar. What great candy! Thanks for the chance to win! thanks for a chance on your giveaway. My sister and I moved to a new blog combining our projects.